or bestow them in the lining of my hat or the case of my rods. Never, till 1890, in all my days did I possess a landing-net. then down stream, then he yielded to the rod and came near me. I tried to unship my landing-net from my button-hole. Vain labour! thing to carry, so is a creel, and a creel is, to me, a superfluity. or twice—a bait-fisher, but I never carried worms in box or bag. so as to get hung up, and I frighten him as I disengage my hook. of short rises, and breaking the gut, with which the fish swims away. As to dressing a fly, one would sooner think of dressing a dinner. vocation is fixed, and I have fished to little purpose all my days. child can capture, but the yellow trout in clear water. loch one man is as good as another, the expert no better than the duffer. as to rise; and I can’t strike in time when I do see him. above, and there is a sauve qui peut of trout in all directions. the evils of ambition; but c’est plus fort que moi. chase, the joys of nature—sky, trees, brooks, and birds. Happiness in these things is the legacy to us of the barbarian. even picture galleries, as many men and most women do already. by streams less clear, indeed, and in meadows less fragrant, than his. keep us from the waterside when April comes. or, like Stoddart, look our last on Tweed. of putting up a rod. attendant, of being “alone with ourselves and the goddess of fishing”! was there no way of getting him to see this and behave accordingly? the last entry in his diary, at Naples, breathes this unutterable hope. once, and strung dozens of other perch on a stick. as it chanced, beside the very stream where I was first shown a trout. have long survived the house to which, of old, the road must have led. up into a tree, perhaps over into a branch of the stream behind us. lift proved successful and he landed on my side of the water. wade and to understand something about fly-fishing. renowned in the sporting essays of Christopher North and Stoddart. and unfair fishing, the border must have been the angler’s paradise. Mouse body and laverock wing. the usual sea-trout tactics of springing into the air like a rocket. only once befallen me since, with the strongest loch-trout I ever encountered. the difference between an alderman and a clansman. easy to catch. One difficulty lay in the nature of the wading. There is a pool near Ashiesteil and Gleddis Weil which illustrated this. may be fished with dry fly; on the Tweed one can hardly manage it. fly on the Tweed between Melrose and Holy Lee can catch them anywhere. with worm, or with the “screw,” the lava of the May-fly. a particular kind of tackle, and cast up stream with a short line. burn, that joins the brawling Borthwick Water. people used solemnly to wash the sand, as in California or Australia. would have held, or not, the trout of the Glengaber burn were good. fight before the fish came to hand. hardly promoted to fly, I have seen many monsters rising greedily. Canal. And this, remember, was twenty miles from any town! out some dozens of tiny fishes, some six or eight to the pound. as of all places the most solitary. And rear again the chaplain’s cell. and with yells from nymphs and swains disporting themselves in the boats. The lone St. Mary’s of the Waves. As not uncommonly happens, Scott uses rather large language here. game of character; but the world of mankind need not rush thither. so lonely that they sometimes, in the end, begat a superstitious eeriness. battle-field, beneath the ruined shell of its feudal tower, to the sea. next day, feeding near his dead body, on a little grassy island. and the salmon cast murmurs hard by the Wizard’s grave. yore, you can find the Fountain of Youth. equal stretch of any Scotch river with which I am acquainted. such spirits, Loch Awe may, with certain distinct cautions, be recommended. the angler who is a good pedestrian may actually enjoy solitude, sometimes. at once large, lovely, not too distant, and not destitute of sport. ugly, has brought the district within easy reach of Glasgow and of Edinburgh. the boatmen are excellent boatmen, good fishers, and capital company. the famous salmo ferox I cannot speak from experience. again, they are perhaps less rare, but they are not very frequent. in the months when most men take their holidays, August and September. is around the islands, between the Loch Awe and the Port Sonachan hotels. winds of April we can scarcely expect trout to feed very freely anywhere. move them with short jerks, appears, now and then, to be efficacious. not pitch their hopes too high. Highlands; it is living yet. my boatman might know the local folklore—the fairy tales and traditions. broke out of the earth and drowned everybody. This is merely a local legend, such as boatmen are expected to know. in his “Irish Legends” (Sampson, Low, & Co.). and James Hogg, the Ettrick Shepherd. they came, though they little liked it, and he was marching them south. except the Black Officer, for it was a great place for ghosts. Officer, he went some way from the rest, and lay down beneath a tree. big red man, and drew up to the fire, and was talking with them. And he asked where the Black Officer was, and they showed him. there was the Black Officer kneeling to him! they walked away, and the Black Officer came back alone. of corpses built up in front of him, and was fighting across it. of young Campbell in Sekukoeni’s fighting koppie. again, and with one thing and another they brought him round. took him home to his own country, and he lay in bed in his house. and sit on a chair beside the bed, speaking to him like a man. was with him. It was just the last night of the hundred. him they had seen by the fire on the march, as I told you at the beginning. best men he could find to accompany him to some deer-hunt or the like. unwell!—and he could not go, but stayed in bed at home. name of the man who committed the murder of which Alan Breck was accused. But this secret I do not intend to divulge. The story of the Black Officer then seemed absolutely unpublished. 1890, it turned out that he was not wholly ignorant of the legend. a snowstorm. This Major Macpherson was clearly the Black Officer. science than his attachment to literature in all its branches. the Black Officer if it had not formed part of his original legend. in 1799, is given by Hogg in “The Spy,” 1810-11, pp. 101-3. I offer an abridgment of the narrative. of friends went out to hunt on the Grampians between Athole and Badenoch. bothy, and, having meat and drink, they abandoned themselves to jollity. to the Major, and he followed him instantly out of the bothy. half-way back, though only twenty yards away. that the mirth was marred and no one cared to ask him questions. bothy, some considerably mangled, but some were not marked by any wound. tossed to a considerable distance. the boatman was acquainted with a traditional version of that wild legend. I found another at Rannoch. lovers, but this prudent lad never took his lips off the Jew’s-harp. into the hills from these cruel airy shapes of false desire. Witches played a great part in his narratives. swelled up suddenly out of the grave of a witch who was buried there. were after her, and chased the hare into the old woman’s cottage. “Tighten, hare, tighten!” and it was choking them. to save her from them, and she promised never to plague him again. up, oh, as high as that green hillock! but the woman she made it on fell into a decline, and took to her bed. confessed that he had committed nineteen murders before he left Scotland. inn of assassins in a lonely district of the United States, which Mr.
murders in the Ratcliffe Highway. and terrors of the night; but why should I exhaust his wallet? that the boatman has given his consent to the printing of his yarns. them seldom tell them in Sassenach. Borlan, close to the well-known little inn of Alt-na-geal-gach in Sutherland. or were, “fat and fair of flesh,” like Tamlane in the ballad. will increase in weight, and what curious habits they will adopt. wild-fowl generally dwell among the reeds and marish plants of its sides. to give an appearance of multitude. But this appears improbable. they had not been netted: yet no trout seemed to be on sale in the village. short than not rise at all. ever get them. They rise freely, but they always rise short. the handsomest Test trout, but they almost invariably miss the hook. without white waves breaking, is, as a rule, best for a loch. which I shall call, pleonastically, Little Loch Beg. lamps, or by tall sedges and reeds. Nor is the wading easy. broken, as I was using very fine gut, and the fish were heavy. a ripple seemed to send them down. but we never succeeded in landing any of the really big ones. have I ever seen so many really big and handsome fish feeding. out of reach without a boat, where the leviathans lived and sported. come to grief once more. as I could; it was very little. and the big fly fell very awkwardly in the dead stillness of the water. off in mid-journey, but they never broke the uncompromising stout tackle. way, and I fear some one has put a Berthon boat on the loch in April. which one might catch that make the tarn so desirable. for sport, if trout were introduced where they do not exist already. a splash that echoes through all the circuit of the low green hills. their species, as small trout are never seen there. in the water when hooked, are these children of the remote West. He seldom landed the golden fish of the old man’s dream in Theocritus. is much worse conversation than that. to make a start, the cockney element is most visible at the first. the life of a Loch Leven boatman than in most arts, crafts, or professions. will prove a good bay depends on the strength and direction of the wind. early start when there are many boats out. this by saying that they are the descendants of land-locked salmon. has very good reason to congratulate himself, and need envy nobody. more unfortunate than that of 1889.
sport it must be, as a trout of a pound or so has no chance on a trolling-rod. the inefficient angler that one can hardly expect to see it abolished. which he once hooked and held on to, is named after him, on the Tweed. of a beacon, a sign that a rescue was at hand. consolation,” and the exiles may have been of his mind. after all, her shrewish female gaoler made the passionless life impossible. than thine I scarce dare speak of the adventure. to the loch when I have the luck to be within twenty miles of it. sang that good old angler, now with God, Mr. Thomas Tod Stoddart. stream to depopulated burn, and all is fish that comes to his fly. with their dyes and dirt, are also responsible for the dearth of trout. before risking his life by smothering in a peaty bottom. through much of Scott’s country and most of Leyden’s. I am credibly informed that persons of culture have forgotten John Leyden. The friendship, like an elder brother’s love. cold remains, and people who do not know may not care to be reminded. Not that it was red when we passed, but electro purior. Towers wood-girt Harden far above the vale. And very dark green, almost blue, was the corn in September, 1888.
but the plough has passed over all but the upper pastoral solitudes. has not lately emerged from Alemoor to attack the casual angler. You climb again by gentle slopes till you reach a most desolate tableland. where first I met the Doctor. wherein if you set foot you shall have thrown your last cast. round to the east side, waded in, and caught two or three small fellows. the already weakened part of a small “glued-up” cane rod. watching Nature, not without a cigarette. comfort to me now. Smiling she gazed on my discomfiture. and white around me, with its moonlight tint of green in the veins. his fiendish guile, and I walked away. There was no rise now, and the lake was leaden and gloomy. forest of reeds I could not. At last I did the fatal thing. I took hold of the line, and then, “plop,” as the poet said. down deep into the water, but it stopped somewhere, and I made a cast. The black water boiled, and the trout went straight down and sulked. unlike the comely yellow trout who live on the gravel in Clearburn. the steepest, and the greenest cleugh that is shone on by the sun! west, and all the broken hills looked blue against the silvery grey. Winds and clouds for ever going. a supply of Bloody Doctors. But we never had a chance to try them. The circumstances which attended and caused the death of the Hon. and passed and executed sentence on himself, I have now to show. the most lively apprehensions. These were soon justified. Trows,’ Mr. K— saw a salmon leaping in a very curious manner. On a closer examination, he found that the fish was attached to a line. publish my friend’s Apologia pro morte et vita sua. I feel that I would do the same thing again. of a seeming self-sacrifice, which, perhaps, is but selfishness in disguise? a happy life, unvexed by memories of one who loved her passionately. the porch of the church, while I, dishevelled, mud-stained, half-drowned—ah! of explanation, my appeals for mercy, were returned unopened. is fitly punished;’ but her peace of mind will gradually return. “So much for my motives: now to my tale. you joy, sir, and Miss Olive, too. It’s a pity, though! in Hampshire, was to be early—half-past ten was the hour. a measure of the due size of water. alone, of course? I always disliked the attendance of a gillie. the stream, which flowed within a couple of hundred yards of my quarters. rushed straight down the pool, as if he meant to make for the sea. he slackened a little, dropping back, and I got in some line. was slightly agitated, and then, back flew the long line in my face. Gone! I reeled up with a sigh, but the line tightened again. a stone. How long? Ah! I cannot tell how long! I heard the church clock strike, but missed the number of the strokes. for a moment near the surface, but he retreated to his old fastness. down my rod, and flown on the wings of love to Olive and the altar. strike. He came up and lumbered on the surface of the pool. fell on him, struggled with him, but he slipped from my arms. In that moment I knew more than the anguish of Orpheus. Orpheus! steep bank, along to my rooms. I passed the church door. Olive, pale as her orange-blossoms, was issuing from the porch. The clock pointed to 10.45. I was ruined, I knew it, and I laughed. done had I been Houghton Grannom I may not venture to divulge. on young minds the supreme necessity of carefulness about details. try a hopeless cast, in a low water, without testing his tackle? wisdom from this spectacle of deserved misfortune and absolute discomfiture. 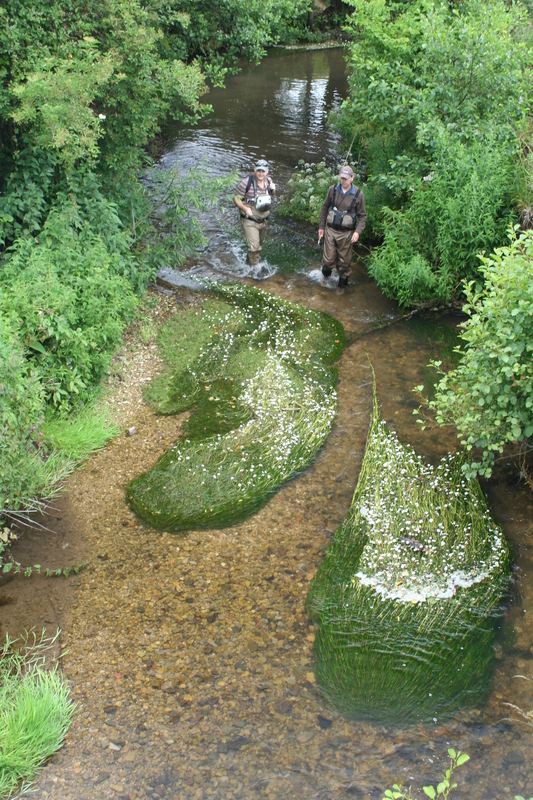 delicacy—that is, trout-fishing on the Test or on the Itchen. Invenies alium si te hic fastidit. to disentangle the fly from the branches of ash and elm and pine. There is no delicacy, and there is a great deal of exertion in all this. and vanishes for ever. What says the poet? In all the furred and feathered clans. He is the Salmo irritans! and patience. The choice of flies is almost a pure accident. Every one believes in the fly with which he has been successful. they will bite on one day and not on another, or rather, on many others. are the only ingredients of ultimate success. spite of the greater stream’s far greater and more varied loveliness? Sae saftly meet and mingle there. Will wander, bright river, to thee! Life is always “the boy” when one is beside the Tweed. Till all his eddying currents boil. that now mouldering and roofless hall, with the peaked turrets. failure, and even of half-drowning. through among the dark old thorn-trees, remnants of the forest. it did not seem worth while to go back for this indispensable implement. and diverted myself from the bank. It was to little purpose. put on with the enormous boots, and the gigantic rod was equipped. spirit of Don Quixote with his helmet, I did not try it hard. to wait for half an hour, and then try the fish with a smaller fly. shrieking of the reel, as in Mr. William Black’s novels. the salmon was once on, handed him over to the gillie to play and land. as it is called, but plunging with all his weight on the line. casting line had snapped at the top link. Now “sniggling” is a form of cold-blooded poaching. was dreadfully frayed, and with a heavy heart I began fishing again. of forward thrust of the arms, a knack not to be acquired in a moment. could have sat down and gnawed the reel. What had gone wrong? fragment of minnow tackle which fastened it to the cast. a small “cobbery,” a sea-trout fly from the Sound of Mull. the chances of the day were gone, and seldom have salmon risen so freely. fellows, who make all trout, even sea-trout, seem despicable minnows. expects no fish, will always be meeting heart-breaking adventures. when such accidents befall you? In Ettrick’s vale is sinking sweet. memories of Scott at Ashiesteil, and of Muckle Mou’d Meg, at Elibank. the fly-book and the landing-net, but the rod and reel at home. As they gleam in the rays of the sun. That bind the wild streams of the North? will never change his love. over the weeds that usually line the watercourses. was often enough for lucky people who did not get letters twice a year. gives some idea of the delightful absence of population in Glen Aline. I had come across the tale in my researches into the Unexplained. ruins which attest the presence, in the past, of a larger population. and morasses of Glen Aline into less melancholy neighbourhoods. with my labour, and went a-fishing when the day promised well. “puts down” the trout and prevents them from feeding. as they were with sunset, behold, there was the Other Man at work again! in the loneliest regions, and thereby, of course, spoiling my sport. and was so manifestly anxious to shake me off, that I gave up the pursuit. It was no affair of mine, and yet—where had I seen him before? again to Loch Nan. But this time I took with me a strong field-glass. and crawled like a deer-stalker to the skyline. sure enough; moreover, he was playing a very respectable trout. him, and that he must pass me on his way up the little burnside. burnside to the left, and was lost to my eyes for a few moments. on the open undulating moor, with no human being in sight! this, I remembered, were in the experience of Sir Walter Scott. about, searching the low heather as I had done, but to no purpose. He rode on, and, glancing back, saw the same man at the same place. He turned his horse, galloped to the spot, and again—nothing! there is any shame in the confession, on my head be it! an exemplary drenching, I succeeded in getting him on to dry land. was to bring water in my hat, and remove the black mud from his face. clogged as it was with peat-stains, showed flecks of grey. the shock of his accident had broken some vessel in the lungs. Nan and the vacant moors—my memory wandered. better than an excessively probable hypothesis. character we naturally saw each other less, but we were still friendly. morocco livery, doublé with red morocco, and, oh ecstasy! Mon Roy.” It is known to the curious that Louis XIV. crown had gone down into dust. Allen showed me the book; he could hardly let it leave his hands. leave to go with her and Mrs. Breton to the auction-rooms next day. to me. You would not have called him a gentleman perhaps. However, I admit that I am possibly no great judge of a gentleman. to see Mr. Mortby?” mentioning a well-known Oxford bibliophile. “Wharton,” he went on, addressing me, “this is Mr.
“Certainly,” answered Allen, looking rather surprised. “You’ll excuse me a moment, Wharton,” he said to me. “Quite certain; besides, I looked at a church clock. fallen behind a row of others, and has been found by this time. “Then why did you smile—don’t you remember? she said. And the subject of the conversation was changed. of an evening paper. There was no more public scandal than that. he went after leaving Blocksby’s Allen refused to answer. fellowship; he took his name off the books; he disappeared. dead, but well remembered. Ask Mr. Quaritch! though nobody paid any particular attention to the demonstration. As for Allen, he had vanished; he was heard of no more. clearer and sweeter than the water of the loch. and he put his hand in mine. long I sat there; I had put my coat and waterproof under him. He wrote in a faint scrawl, “Help me to that burnside. plainly enough betrayed the original user of the hiding-place. opened, and the office-boy, a young Jew, slunk cautiously out. On seeing Allen, he had seemed at once surprised and alarmed. be back immediately,” and requested Allen to go in and wait. and went up to Oxford. it is likely enough that he would have involved Allen in the grief. Then Allen would have been in a, perhaps, unprecedented position. refusal that told so heavily against him—is now sufficiently clear. Breton did not, is thus part of the History of the Unexplained. in a criminal trial, nor acquit a wraith. hypothesis on which, of course, we are bound to act. behind him little but an incident in the History of the Unexplained. Scotus.—Well, now let’s go to your sport of angling. Where, Master, is your river? three inches of water in it. his hatches, an you have a crown about you. must, here, Master, is the coin. [Exit ANGLUS to the Mill. He returns. rising. You shall see a touch of our craft. and flicks his fly for about ten minutes. fish, and now, disentangle my hook. with the nettles; also I marked the fish hasting up stream. Anglus.—Nay, come, we shall even look for another. vegetables cover the waters! We shall have no sport. Scotus.—Nay, Master, this English angling is over costly. The rent of your ditch is high, the expenses of travel are burdensome. life, writ by worthy Master Hackle long ago. And all the din of town. And drinks a rousing cup. What think you of my song, Scholar? ’Tis choicely musical. What, he is gone! A pest on those Northerners; they have no manners. the wind. Ho for George! a good Wickham have I lost in George. [He ensconces himself in the middle of a thorn bush. [He flicks his fly for ten minutes. Enter BOY on Bridge. the Bridge. Exit GEORGE. Exit BOY. Anglus.—Oh, Mass! verily the angler had need of patience! the fish, I could find it in my heart to say an oath or twain. yonder ford below the plank bridge. [ANGLUS steals off, and gingerly takes up his position. Anglus.—Marry, that is a good trout under the burdock! [He is caught up in the burdock, and breaks his tackle. no fish that swims, yet the Spectator deemeth ours a cruel sport. [Enter twenty-four callow young ducks, swimming up stream. Anglus.—Oh, mercy. I have hooked a young duck! Where is my landing-net? Nay, I have left it under yonder elm! fray the Rise is over. merry heart goes all the way!” And lo, here comes my Scholar. Ho, runaway, how have you sped? faint-hearted are your southern trout! Anglus.—That fat fellow is a good three pounds by the scales. But, Scholar, with what fly caught ye these, and where? call it a Phantom, Master; wilt thou not try my Phantom? thou art but a poaching knave! Scotus.—Knave thyself! I will break thy head! who will see fair play. Now lie there, my coat, and have at you! [They fight, SCOTUS is knocked down. Scholar? And now, Scholar, trust me, thy guard is too low. I hope thou bearest no malice. of Dundee. This fishing is marvellous hungry work. Scotus.—And now, Master, wherefore wert thou wroth with me? Came we not forth to catch fish? Anglus.—Ay, it may be so. be added that large trout, up to six pounds, are sometimes taken. of delicacy I suppress the true name of the river. did not suggest the composition of the story.